The awesome 1979 Harley Shovelhead Bobber for Sale is a 1979 HARLEY DAVIDSON RIGID BOBBER with a 93" SHOVEL ENGINE and an 8MM BELT DRIVE. The motorcycle was an AWARD WINNER AT THE 2014 CALIFORNIA EASYRIDERS SHOW AND HAS BEEN FEATURED IN EASYRIDERS V-TWIN MAGAZINE. GoGoCycles would also encourage bikers to submit a review of the 1979 Harley Shovelhead Bobber for Sale to help potential buyers make informed decisions and to benefit the biker community as a whole. 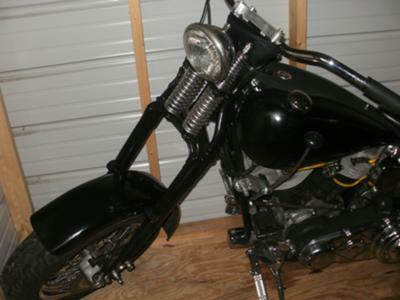 The old Motorcycle for sale is located in Columbus and I am asking a very fair price of $1500.00 or I might consider trades for Hot rods or classic cars but no boats. If you want to Make an offer to buy or present a trade for my consideration, call me (no e-mail) at (760)757-4294 and don't forget to tell me that you found my classified on Used Motorcycles for Sale When you call.